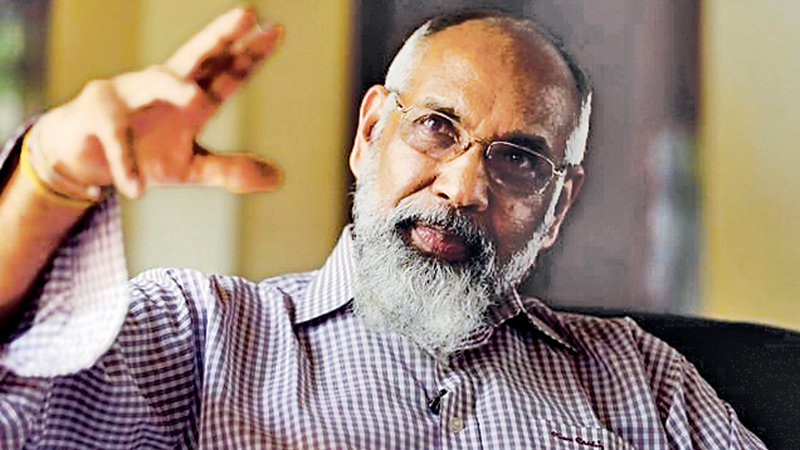 Northern Province Chief Minister C.V. Vigneswaran's comments on the Northern Provincial Council issue, the TNA manifesto and allegations made against him by some sections of the TNA. Q: The attention of the whole country was drawn towards the Northern Provincial Council during the past few weeks. This situation which cropped up after the report of the anti-corruption committee appointed by you was released had created a suspicion that the problem had not reached a permanent solution. What has actually happened there? A: Members of our PC had levelled several allegations against ministers of the Provincial Council for a long time. When these allegations were made, we thought of conducting an investigation into them and appointed a commission. The commission submitted its report to us several days ago. The report stated that two PC ministers had committed wrong. Since the person who had made allegations against the other two persons had gone abroad, it had not been investigated. When the report came to my hands, I took action and asked the two persons who had allegations against them to resign. Since investigations were not conducted on the other two, as the complainant had gone, I asked the two of them to take a month's leave. Q: Haven't you done an injustice to the two persons against whom investigations had not been done? A: Since the complaint did not return, the term of office of the commission expired. But there was a sand that an investigation had to be made. Similarly, more allegations had poured in from people. I thought this was a problem concerning limitation of days. After an investigation was made against the new allegations and the ministers, if they were found not gently, they could resume work. Q: The TNA is a collective of several parties. How did the leaders of those parties respond to the sacking of the ministers? A: Sampanthan and Senathiraja told me that my action was wrong. I told them that there was nothing wrong. Because if the ministers were present during the recording of evidence, the witnesses would be afraid to give evidence. I had to do that because I had to prevent direct or indirect pressure being exerted on the witnesses. If that was not in order, I asked them to give me a written undertaking that no pressure or influence will be exerted on the witnesses. I told them to make observations while we set about our work, but they did not agree to that as well. I said, if Sampanthan gave such an undertaking, I would accept it. But they were not willing to give such an undertaking. The problem was that if I a allowed them, it would have driven fear into the minds of witnesses. Q: On what basis did you appoint a three-member commission to conduct investigations? A: The allegations were made by our own Provincial Council members; if I myself tried to probe them, I would not have been able to do other business of the council. That is why I appointed two retired High Court Judges and a retired public servant as members of the committee. Q: Did the report of that committee say that they were corrupt? A: There was some change. Although the allegation was financial misappropriation, such a thing had not happened. What has happened was while holding office, they spent excess funds on the meetings. There had been no financial corruption. Q: According to our reports, about an year ago, there had been a request for you to remove these four ministers. But didn't you keep silent then? A: Yes, this happened about an year ago. Sixteen members submitted a signed letter requesting their removal. I didn't take action against them because there were no allegations against them at that time. It was just a request to remove the four of them and appoint new ministers. When allegations were levelled, I asked them whether they still insisted on their request; twelve out of this 16 members still persisted with the request and the balance four said there was no need to remove them and requested that they be allowed to carry on. Q: Were those who made allegations against them denied the facilities offered by the Provincial Council? A: At first, the two ministers asked to resign were requested to return all facilities, but later, I decided that it should not be done and further investigations should be made. I thought of a means to give a less harsher punishment. To the other two, I told them only to stop visiting office for a month until investigations were completed. They are still drawing their salary and using the official vehicles. Q:You are the chief minister of the four ministers of the NPC. They are alleged to have done wrong under your period of office. Doesn't this rebound on you? A: I have told earlier that if there were allegations against me, they too, should be submitted along with this because I am prepared to face them. I still say that if there were allegations against me, an independent investigation should be made into them and I am prepared to face it. Q: You became chief minister by joining hands with the TNA. But according to the current happenings, there seems to be a clash between you and the TNA. A: No. There is no such thing. But they are suspecting that I have connections with another organisation named Tamil Makkal Peravai. They think that I am going against the TNA by joining hands with it, but there is no such thing. We have an election manifesto, but I see them going against it. I am against such a thing, but I am not against the party. I am not opposing the leadership. What I say is that there is duplicity on their part. They say one thing here and another different thing in Colombo. This is the problem and nothing else. Q: Didn't the Tamil Makkal Peravei organisation organise the Elangu Tamil meeting sometime ago? What sort of organisation is it? A: It is not a political party as most people thought. It is only a people's organisation. Q: This is a time when the TNA had joined hands with southern political parties to put forward a new constitution to the country. At such a time, aren't your activities an obstruction to the southern unity? A: I will give you a clear answer. What they are talking about the people in the North and East is their constitution rights to be given to them. In such a situation, they should know the ideas and aspirations of our people; when our leaders in Colombo talk something different from the views of our people, we should speak out. Hopes and aspirations and views of the Tamil people are encapsulated in the TNA manifesto. When they stay in Colombo and do something different to the ideas and views of the people, my duty was to point it out. That is all what I am doing. I can give you an easy example. Today, only the 13th amendment is left. If they refuse to give us a federal system, it is wrong. What we want is a federal system. It meant that we would be looking after our own affairs and both parties would be living happily in a single country. But in the 13th amendment, the Central Government had retained all rights. They have given us what they pleased. There is a difference between the two and that is what I am pointing out. Although I am doing this, I have no clash with the leadership. I have no problem if actions are in-keeping with the policies. Q: But the TNA had come to the conclusion that as regards the national problem, it was useless to cling on to mere wordings. A: That is correct. But we must see what decision is given by these people in Court. If it is known in the decision that it is not the federal system and the unitary status is still protected in the country, they may not give us that right. This should be changed. We say that it should be changed and we should go for a federal system. It could be worded in a different manner, but the idea should be there. Q: There is much talk about a coterie of people engaged in spreading communalism in the country. Many people refer to you as a communalist trying to set the country on fire. A: What can I do when they brand me like that? I have only two children who have married Sinhalese. I too, was born and bred in Colombo for the most part of my life. How on earth could I become a communalist then? What do I gain from it? This is only senseless talk.